It is my hope that all of the pups that I raise go to great homes. They are bred to compete and succeed in the Field Trial or Hunt Test sport. I suggest that when picking a trainer that you plan to place your dog for a minimum of 6 months or longer depending on what your goals are for your dog. It is also a good idea to go out and meet your trainer ahead of time or go to a Field Trial or Hunt Test and watch them compete their dogs. 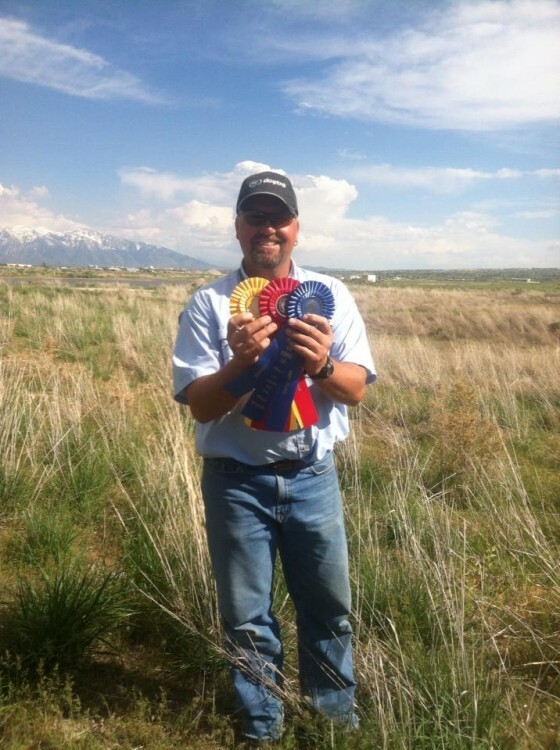 Here is a photo of Pro Trainer Lindsay Robinson holding 1st, 2nd and 3rd place ribbons from the Qualifying at the Northern Utah Retriever Club 2013 Spring Trial. He has Qualified All Age 4 of his 5 master dogs this spring. Lindsay and his wife Jen take a winter trip to sunny Niland Califonia which has proven to play a big part in their training program. This enables there dogs to train in water all winter long.